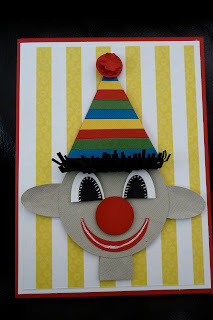 The theme for April's card challenge with Chantell and Kim was "From your childhood". This was so much fun because we could think of so many things it was hard to decide what to do. So here are the results. A family friend knitted us all clowns. Chantell loved hers so much that she slept with him every night. She used his head as a pillow so much she squashed his nose flat. The clown she has made here looks so much like her clown! Hasn't he got a happy face. 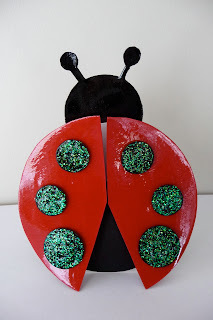 Kim loves Ladybugs! She used to collect them and put them in a jar to keep as pets. She has made this beautiful shiny ladybug card. The wings open up to reveal a place to write your message. I loved to play on the swings. I had a friend Christine who had the coolest orange swing set. I loved going to her house. Here I am swinging with my brother Lloyd, sister Chantell and Christine.